Thank you for your interest in being a vendor at the 13th annual St. Johns Bizarre on May 11, 2019. The application deadline has passed but please read on for important dates and vendor information. If you’d like to be added to our email list, send a note to vendors@stjohnsbizarre.com and we’ll keep you informed with any important craft fair news! 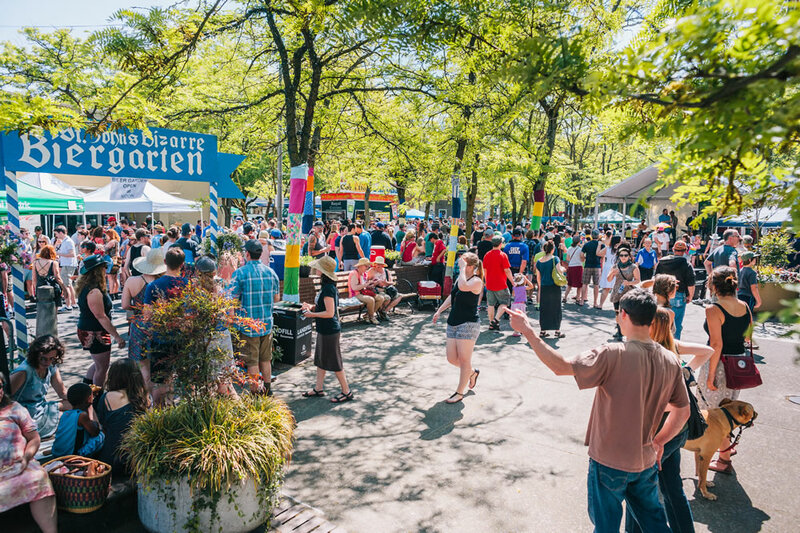 The St. Johns Bizarre street festival is a single day event in the heart of the St. Johns neighborhood in North Portland that celebrates the unique character of the area. The festival has coupled itself to the St. Johns Parade, one of Portland’s longest running parades. The Bizarre typically welcomes over 125 local vendors, selling an impressive array of handmade art and craft items, including jewelry and clothing, home goods, photography, and painting. Also featured each year are a number of food vendors, as well as booths featuring local community organizations. We seek to create a balanced offering of vendors that appeals to the entire community. The St. Johns Bizarre is a juried event, with potential vendors judged on craftsmanship, originality, appeal, and location. We strongly encourage artists and craftspeople from St. Johns and neighboring areas to apply! All work should be created by the vendor and no imported art will be allowed. In addition to arts and crafts, we strive to included a wide variety of local community and food vendors. Due to space limitations, we are not able to accept all food and community vendors that apply. Booth and application fees differ for craft, food, and community vendors. See below for more details. Booth sharing is allowed. Each person must fill out a separate application. If submitting by mail, please submit them together in the same envelope. A separate application fee is required for each artist. Applications will be available here on February 1st. The submission deadline is March 23. We will not accept late applications. There is a $10 non-refundable application fee due along with your application (for arts/crafts and food vendors only). If you are accepted to the show, this fee will be credited towards your booth fee. If you are not accepted to the show, this fee will not be refunded. Application status will be sent to vendors via email by April 7th. If accepted, your booth payment will be due by April 21st. Upon receipt of payment, further information regarding the event will be emailed. Vendors will be responsible for all set-up needs and space will be limited to a 10′ x 10′ area. Vendors will provide their own tables, chairs, and tents. These must not be a hazard to the public or other vendors. Electricity will not be available. Generators are not allowed unless authorized in advance. Vendors are only allowed to set up in their assigned space. Vendor “no-shows” will be charged an additional fee equivalent to their respective vending fee. Under no circumstances will vendors be allowed to break down or leave early, as this disrupts the overall event. In such case, the vendor will not be accepted to future events. Upon breakdown vendors must leave their space clean and free of debris. NOTE: This is an outdoor event. Please plan accordingly. Thank you! Looking forward to my best and favorite annual St Johns Bizarre!! !